Posted: Monday 23rd February 2015 in Paid Media, Thought Leadership. significant growth across most of the world. It is no wonder, then, that Facebook would want to have a share of this market. On 17th February, Facebook announced its plans to enter the PLA landscape. This news followed successful testing with retailers Shutterfly and Target in the USA. With 63% of all adults in the UK having a Facebook profile, (approx. 40 million) and a worldwide user base of 1.4 billion, the potential reach for Facebook activity is gargantuan. Facebook collects a huge amount of detailed customer data, including what users like and engage with, their browsing behaviour and basic demographic information This amounts to a fantastic base of information that retailers can leverage in order to target the correct people with the correct products. 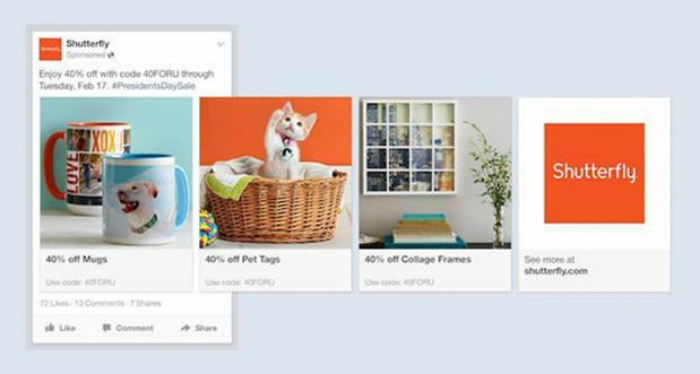 The process for Facebook product ads will be similar to that for Google Shopping in that it will be feed driven; product information will be complied and automatically updated with changing prices and availability as the feed is updated, meaning only accurate data about available products will be served to the user. We expect the feed and feed data to play as important a role as it does for Google Shopping, with accurate data and robust management likely to be imperative. You can use the product categories to target particular existing demographics, or let Facebook use its extensive knowledge of each user’s behaviour to deliver the most relevant products to them. Facebook creates the ads and then personalises each for the desired recipient, meaning short setup times. 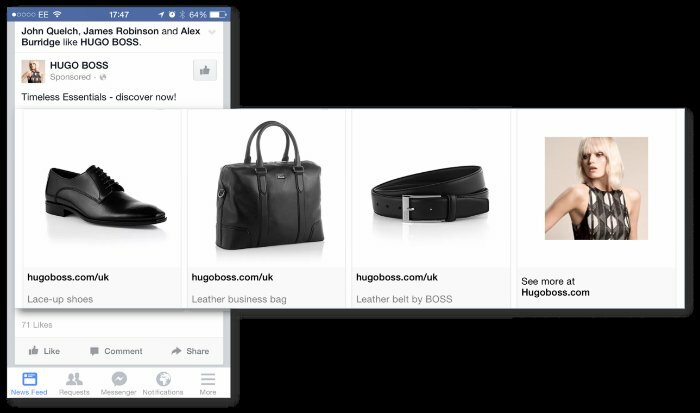 The Facebook product ads are expected to be fully launched in the UK early March. Early adopters such as the below are, however, already serving ads to the UK. Over time, Facebook will be collecting vast and very valuable insights into how personal, demographic and shopping behaviour links together. These learnings can then be harnessed to improve performance for future marketing campaigns, not just online but offline too, as well as across different platforms and medium. Watch this space for updates over the coming weeks. If you have any questions or would like to know more please contact Dave Trolle on (01482) 876 876.